, one of their first english gigs at docking the versions from norwich at the london palladium in the melody maker beat contest with heats held in brighton, so many of those groups you mention played at both docking and heacham, more later. scratch your heads!!!! congratulations to all of you. Welcome to the forum willh. Picture of Barry on here in the COOPERS thread. he performed also as the surgeon behind a sheet !!!!!! tony rivers and the castaways,bo st runners,elkie brooks,the epics,swinging blue jeans,pinkertons colours, brian poole and the tremeloes,the fourmost, more to come !!!!!!!! I never went to Heacham Village Hall but I remember they were very lucky to book groups to appear when they were high in the charts, Peter and Gordon when they got to number 1. Geno Washington and the Rockin Berries also put in a few perfromances. Docking I went to only once, if you could not get a lift in a car, anyone got a car? It was not easy to get to from Hunstanton, never had enough time to say goodnight to who you picked up on the night! There was a free bus from Lynn and others from around the area. I remember because one night I hopped on the bus to return home after the dance but it was the wrong one. (I had seen Toni Byrne on it but didn't realise that she was with her friend and was staying with her). I finished up in Cromer at 1 am and my dad had to come and collect me wearing his pyjamas. I have never been allowed to forget this! Nice to see we are getting some response, how the hell that guy finished up in Cromer I do not know, the free buses came from ,lynn, burnham market and rudham I think maybe fakenham on special occasions. The group from Scotland I mentioned, Dean Ford, changed their name to the Marmalade, they were frequent visitors to Heacham, Geno was also a frequent visitor, when we had the outside event he was carried round the field shouder high as shown in one of your pictures, the small faces were no 1 on the tuesday following that event, but Geno was star of the day. One of the best nites at heacham was with the Birds, not Byrds, there were 800 in that nite approx , I think the current fire regs allow about 150. Ronnie Wood later with "The Faces" and now with "The Stones" was in "The Birds" .Never saw them at Heacham but saw them in Derby, what a great band they were. When Spainguy saw Toni Byrne sitting on the bus he must have assumed it was heading for King's Lynn because Toni is a King's Lynn girl. 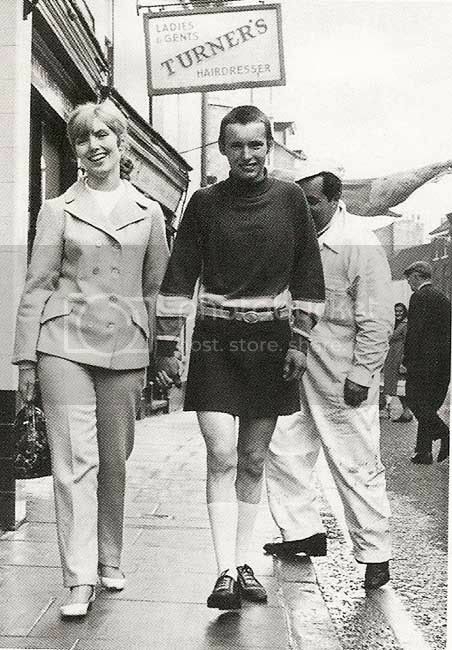 Here she is in 1966 when she dared Tony Lidgard to walk down Norfolk Street wearing a miniskirt she had made. Picture of Toni and Tony..
A little more to the history of the public hall at Heacham, a very good friend of mine, informs me that prior to John Bennet at Heacham was a guy by the name of Basil Leroy, this was prior to the 60,s he brought some more normal bands there including Reg Dixon of Blackpool fame. I think some of the facts regarding Toni Byrne are incorrect,I always thought it was Teressa Byrne,when i was about 7 or 8 i was friends with her brother Berny probably the most unlikely person to ever go to the Covent.As for the Mini skirt on mr.LidTerry Lidgard I think it was made by my ex wife Jane Tuffs who with her mother owned ACTION ONE boutique in Norfolk Street.Jane and terry appeared on Anglia television and the only way Terry had the skirt on is because i blatently refused.I hope this starts jogging peoples memories,Any tales about the Whisky. There is also A picture of your old shop "Timberland" in that section that you may have missed John. caught the free bus.at the end of the night got on the bus and dropped off every 100yards. but i hit the bus stop sign doing about 50 m.p.h.i woke up in casualty. John, Got my information on Toni/Teresa from one of Bob Booths books, but I occasionally see her around so I'm determined to check out her real name. My girlfriend, now wife lived opposite you John in Avenue Road way back in the 60's. I remember your scooter and Alan Hartridge was in my class at Gaywood. The Whisky-a-go-go days were great..